There are basically no limits when it comes to how much money one can spend on building a sidecar. In order to keep some kind of budget and schedule one needs to make compromises. This is the story of a rear shock. I decided to listen to the experts instead of my intuition and went forward with a modified BMW rear shock. The modification was simply changing the stock spring to a harder one. 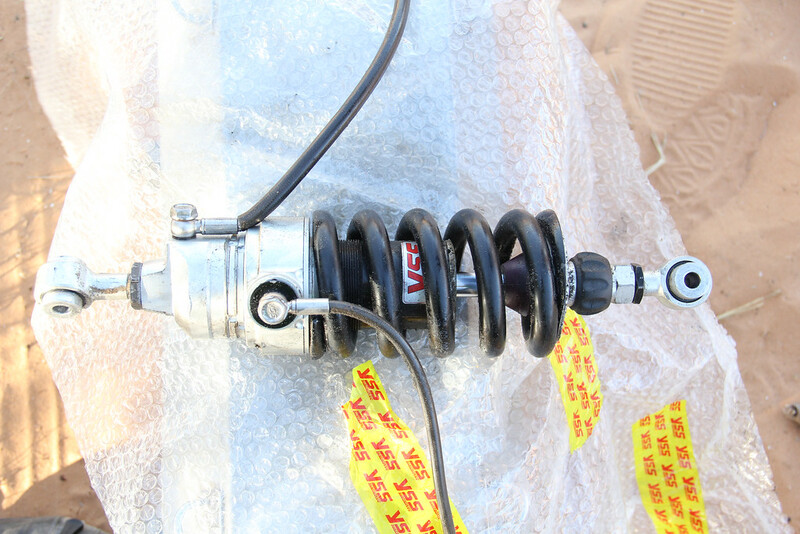 When I picked up my sidecar from Germany, I had what I call version 1 of the rear shock. The bike handling was great and I was all excited. The 1000km maiden journey back to Finland were real fun. The bike was heavily loaded on the day of departure! The ride via Baltica (with plenty of fast gravel roads) back to Germany was all fine and when we arrived at Mueller-Gespanne we measured the load of the bike - I cannot remember exact numbers but it was almost 800kg! According to my sidecar builder the sag was too big due to the spring being to soft and thus not being able to carry this load. 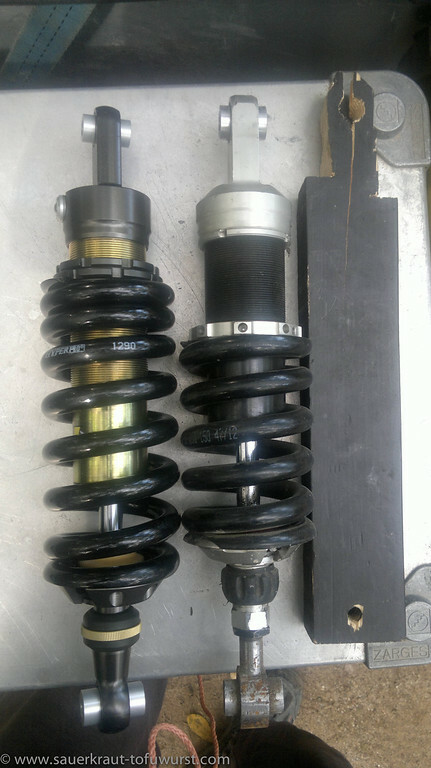 The easy solution would be to make the spring even harder but then again the shock body starts to look ridiculous small compared to that heavy duty spring. That was the reason we rode to the YSS - shock experts on the other side of Germany near the Dutch border to sort this issue out for once and all. I am not a suspension expert but I know when I a shock cannot be installed. We went to that expert in Germany (YSS development is in Netherlands). They explained me that with such heavy spring one needs to use a bigger and stronger body. They also explained that an external reservoir would significantly extend the life time of the shock. In addition the load on the bike would vary a few hundreds of kg between empty and full and thus the preload adjuster would be very handy. OK, made all sense – let's got for that. 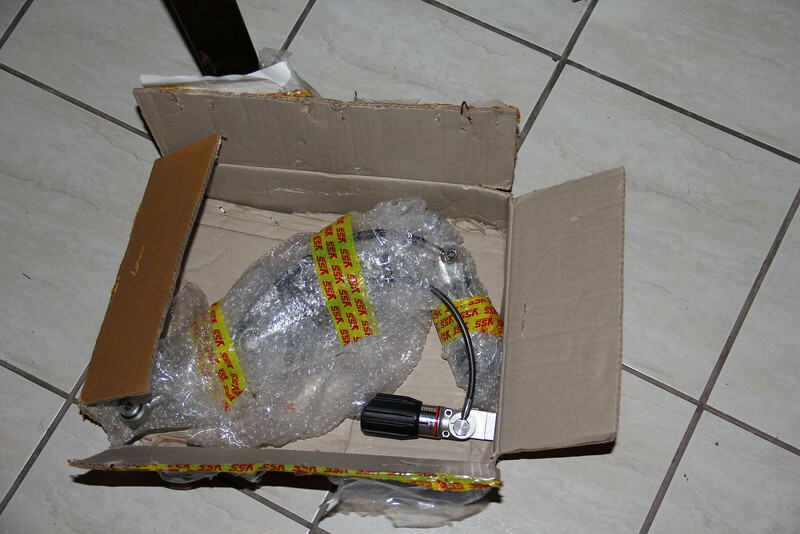 The shock which I received the next day did not the have the preload adjustment and even then it did not fit into my bike! There was not enough space for the shock to fit into the subframe. Thus I road to Netherlands and visited the YSS development department with my bike so the R&D guys can see the issue first hand. Either YSS has never built such a shock before for the R1150GSA or my subframe has been modified in a way which I have no knowledge off (which I doubt). YSS decided to make a new kind of body so that it would fit my bike with the external oil reservoir and the pre-load adjuster. 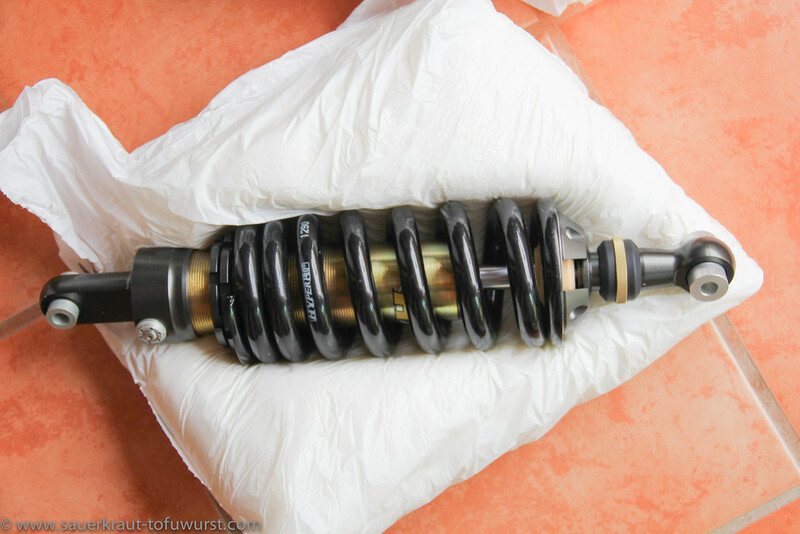 I continued to ride with my BMW shock until Spain when I finally got my YSS shock. I could not install the shock because the connections for the reservoir and the pre-loader were on the wrong side. Thus I opened both of the mounting bushings (both ends have thread as for height adjustment), turn the shock around until I was able to install it. I made sure that both of the look-nuts were tight. About 200km later on some backcountry road, it was on a tiny bump that suddenly I lost all oil. Skippy confirmed that I put a nice cloud of smoke up into the air. The fixing screw from the reservoir line at the body was all loose. Additionally both of the mounting bushing were not tight at all anymore. It seems that those adjustable mounting bolts are not a good idea as they tend to get loose. 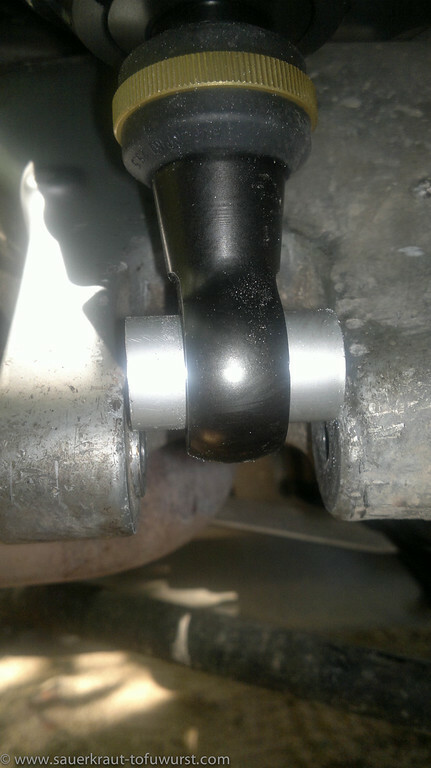 If you happen to have a shock which has both mounting bolts adjustable (the upper and lower one to adjust height and make it fit) then the entire shock appears to turn and causes all sorts of domino effects and damage to other parts (e.g. The screws to the reservoir might bang against the subframe, shock collapses and damages rim, tire, break system, other parts). Since I did not have a spare shock with me and I needed to move around somewhat (for shopping food etc.) YSS send me a spare shock while I send the prime shock back for repair. The spare shock had no external reservoir neither a preload adjuster. The upper mounting bushing was now one with the body whereas the lower mounting bushing still allowed to adjust for the height. A few weeks later while I was in Morocco I got the prime shock back and after a short test drive of about 20km I noted that it started to leak oil from the center shaft. The driving comfort with the prime shock was much better compared to the spare shock and I decided to find a local shop to fix the leaking. To be honest I have no idea what they did but it worked fine. Well, it worked for the next 1000km until we hit a bad road in Mauritania. On a tiny pothole my shock totally collapsed. This time it was the collar on the body which was all the way moved upwards. I put in the spare shock and ever since I was riding happily for the next tens of thousands of kilometers until Death Valley, California where I rode my sidecar into pieces on a famous 4WD track called Racetrack Road. I noted later during the repair of the bike that the spare rear shock started leaking and needed fixing in the upcoming weeks. Collapsed (prime shock) ... and that was the end of that rear shock. If possible have a spare shock with you including the two mounting bolts (and potentially a spare bushing incl. something to get the old one out). It was not until Phoenix, Arizona that I had a chance to discuss the shock's design with one guy at a dealer. Since we had now both shocks on the table (the collapsed prime and the leaking spare). It appeared to be that look nut was too thin and did not give enough thread to hold the spring. That seems to have caused the collapse in Mauritania. Furthermore the lower mounting piece was all bent and obviously neither designed for the occurring forces. The spring is rather short. I would not be aware of the consequences of this fact until later in Mexico. Both YSS shocks on the table (Note: the prime shock got a stronger collar in Las Vegas) and me measuring that the preload on the spring. Make sure that the collar is wide enough and the bottom spring mounting piece is thick enough too withstand the forces. It was in Durango, Mexico when I did see one of the gazillions of speed bumps too late and went over it too fast. It made Kaboom. The result was that the lower mounting bolt snapped in pieces and the entire bike was sitting on the rear tire. The first fix of making a new thread on welding it onto the old part lasted only 300meters. The next version made out of solid steel lasted until I exchanged the entire shock. Anyway, as a result of those bad hits, the shock was leaking again. Besides that I could feel some tolerances and the bearings appeared to have tolerances by now and would need replacement. Maybe that caused the bending of the M10 mounting bolts. I had enough of that and ordered me a Hyperpro shock. After I had the new Hyperpro in my hand I could make a few comparisons and collect some “hard data”. Let's do a little math here and look at the difference "Shock body stroke" minus "Spring stoke". Spring stroke must be bigger then shock body stroke! 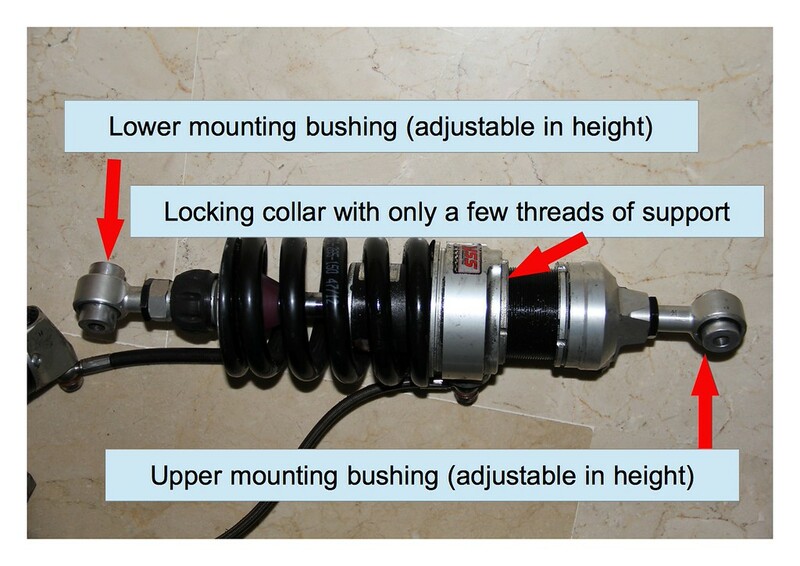 If the spring stroke is smaller then the shock body stroke it means that the spring will become totally compressed and thus the entire shock will be as hard as a metal piece. The worst part is that this transition from total compression to metal piece happens abrupt - like bang your head against the wall and it hurts. In case of a rear shock, it snaps. 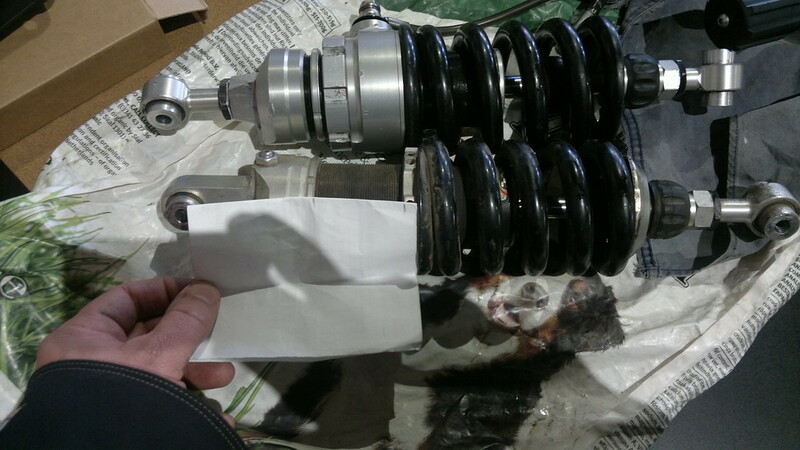 No wonder that this YSS shock went broken and in hindsight I am surprised that it even lasted that long! In short, I must say that I am deeply disappointed of YSS. 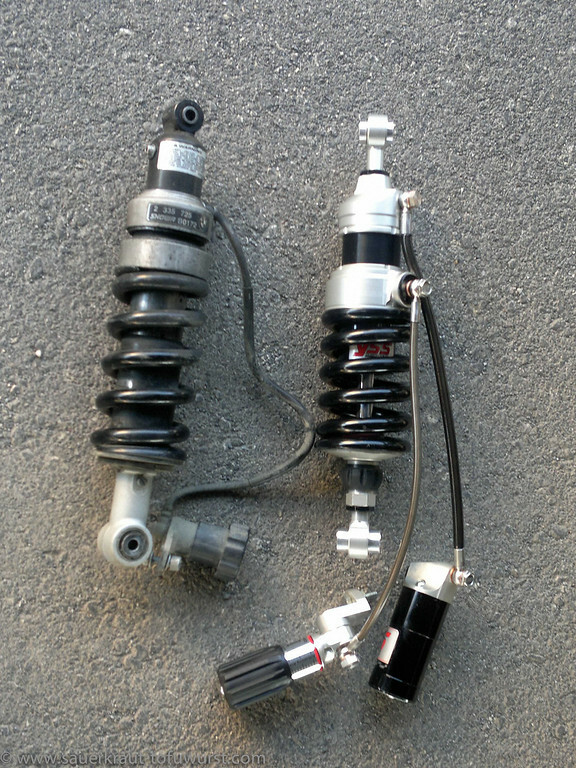 The design of both shocks was clearly flawed from beginning on (-> stroke!). The design of the prime shock was rubbish and I was lucky to get the 1200km on this without getting into any accidents. This is how YSS sends a shock to its customer. Sometimes it's better to follow your instincts and not follow experts. Experience is no guaranty for knowledge. I have spent several hundreds of Euro extra on all this trouble and experimenting. Shipping, customs, extra nights in hotels, driving around in Europe, repairs and so on. 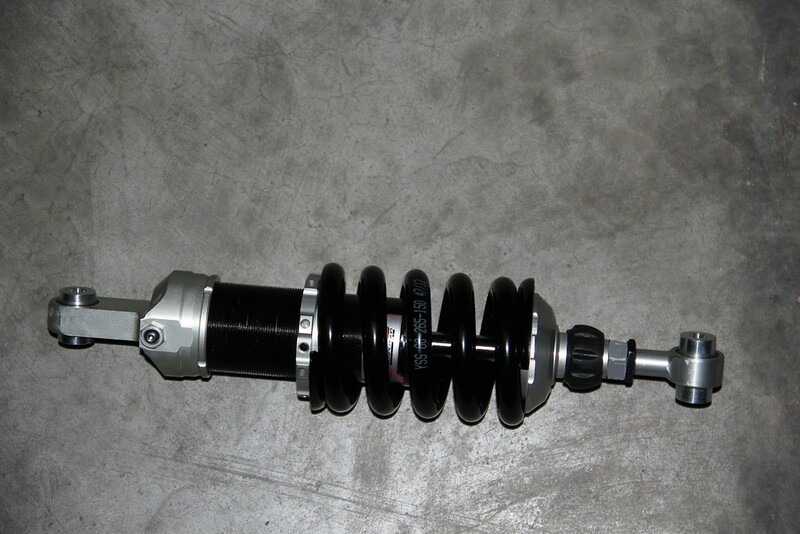 The costs were more then a brand-new shock from Hyperpro. 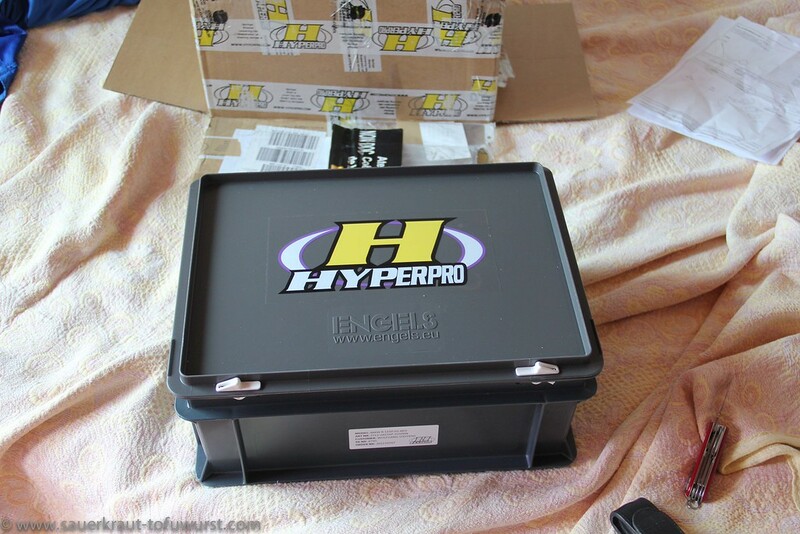 When I send my request to Hyperpro for building a rear shock the guys instantly said that an external oil reservoir is not possible neither is a preload adjustment. It will be a basic shock and that's it without any extras. The spring is progressive and the hardest they can find in those dimensions. Anything harder (and thus thicker) would lead again to the fact that "shock stroke > spring stroke" (or something like it). Hyperpro, YSS and wooden emergency shock side by side. One mysterious issue remains open also with Hyperpro when it comes to the installation. I had this problem with the spare YSS shock and now with the Hyperpro one. Shock did not fit in the first try. As I was told (later) one needs to push the bushing back before installation :-o (that's why the spare bushing in list of spareparts). The first 150km with the Hyperpro shock went fine and the handling is ok (to the extend I can judge that on Mexican roads). Do not try to fix a leaking shock which has been abused heavily. Get a new one and be happy (the extra money is saved later in unwanted stays in hotel bills and customs). You might ask what about Oehlins and Wilbers? Well, Markus and Karina (from Estonia) rode around the world 2up on a R1150GS and they burned several shocks from those brands. The only one that lasted somewhat was the Hyperpro. If it does not last on a solo bike how would it ever last on a fully loaded hack. Disclaimer: my observations and my opinion! Excellent post and it also comprises a lot of useful facts- Thanks for valuable information. Really enjoyed reading it. Please visit my RTCA-Do160 page and please leave comments. Thanks for the review, it is strange what you say about the WILBERS as I have supplied and used plenty of them here in South AFrica and believe me we have tough conditions here. They are the one brand that lasts. This is mainly because WILBERS is built to the conditions and weights you prescibe and I have also supplied our local Side-Car builder here with a few WILBERS conversions with success. WILBERS also specialize in side-car shocks supplies.